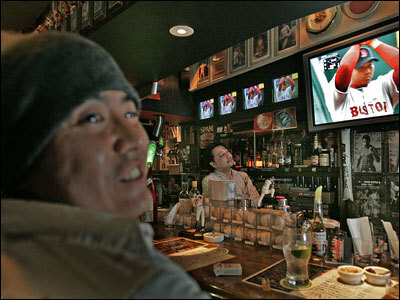 TOKYO -- Its after 3 a.m., but that hasnt stopped die-hard Dice-K fans from pulling an all nighter at the Brain Buster sports bar here to watch the Red Sox ace make his regular season major league debut. Satoshi Ishimaru and his two friends cheered and clinked glasses of vodka and tea as Daisuke Matsuzaka took the mound more than 6,000 miles away in Kansas City. These newly-minted Red Sox fans said they are looking to the 26-year-old phenomenon -- featured on nine television screens across the front of the bar -- to show just what Japans baseball prowess is all about. Dice-Ks debut with the Red Sox has dominated headlines here for months since he signed a $52 million contract to defect from Japans domestic baseball league to join Bostons best. While Japanese media have traipsed every move of the Yokahama native in the United States, local television stations fanned across Tokyo to capture baseball fever in the pre-dawn hours. By 4:30 a.m., Madoka Oda munched on noodles at the Brain Buster bar as the Red Sox scored their second run against the Royals in the fifth inning. Oda, 38, said he wants to see Matsuzaka do well and be acknowledged as a good player, not just a good Japanese player. A half hour later, as Matsuzaka finished up the 6th inning, Oda fell asleep, his head on the bar. It was already two hours later than bar owner Kyozo Watanabe usually kept open his pub -- which has a picture of Fenway Park at the entrance. But he received too many requests to show the game to turn his customers down. By 5:15 a.m., as Matsuzaka stuck out his ninth batter, Watanabe poured himself a drink.